There are anomalies appearing out of nowhere and through them lumber ancient beasts- in this case the return of fantasy telly to our screens. Telefantasy was the Cinderella of tv, kept in the kitchen doing the mopping all the way through the 1990s. Thankfully, that all changed one amazing March evening in 2005 when ten million of us urged a 19 year old shopgirl to go on the trip of a lifetime reinvigorating a moribund genre in 45 minutes. Now we have the first really serious contender to rival the returned resurgent Doctor Who. You couldn’t accuse ITV of underselling this series. 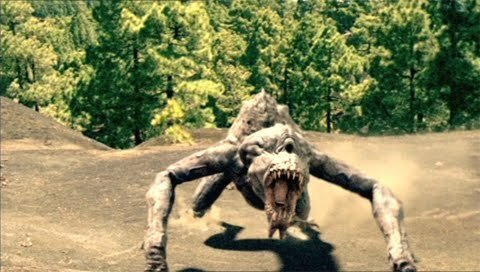 The first trailer I saw for Primeval was actually last autumn sometime in the cinema, no less. An atmospheric affair involving a child terrorised by an unseen monster it certainly gave the impression that the channel had uncorked something memorable, a feeling reinforced by the trailers that seemed to be on continuously in the few weeks prior to transmission. Each of the principal cast were seen sprinting through what looked like docklands while a voiceover told you something about them. Oddly it did not say “she used to be in S Club 7” when it came to Hannah’s bit. Advertisers of no less a reputation than Saatchi were also hired to create an off-air campaign, encompassing outdoor and press ads. The buzz slogan was “Time for Adventure” and the feel was that the programme would be exciting and cool, a notion reinforced by the use of a Muse track for the background. Wary (and eventually plain weary) of the comparison, the creators of Primeval nonetheless hoped to generate the sort of buzz that had gone a long way towards making the revived Doctor Who such an instant hit two years earlier. Only of course there were differences; Who was a globally known franchise with a rich and proven history whereas Primeval was something entirely new. Well, to some extent. Nevertheless you have to admire the confidence of a promo campaign that didn’t show us a dinosaur of any kind till a few days before the first episode. It was back in the early 1990s that we first experienced the thrill of seeing dinosaurs looking like real animals thanks to ILM’s groundbreaking work in the film Jurassic Park. Up till then generation after generation of kids simply had to make do with illustrations, reconstructed museum models, animation or, if you were unlucky enough to have seen the Doctor Who story `Invasion of the Dinosaurs`, purple glove puppets. Yet when we saw dinosaurs moving and interacting with each other and their environment the effect was jaw dropping. Over time though, they have gradually become something we’re used to seeing; rather like the first computers which were treated with reverence and caution, real looking dinosaurs have become as ubiquitous as spoons, shoes and coffee. Yet there’s always been a nagging feeling that however awesome they look nobody has really created an impressive story to go with them and the promise of Primeval was that it would right that wrong. The basic idea for the series came from Tim Haines and Adrian Hodges who had first worked together on an adaptation of Arthur Conan Doyle’s The Lost World but it would take seven years before the project came to fruition during which time the playing field had changed. For more than a decade both BBC and ITV had shied away from what came to be known as `telefantasy` ; even the rare shows they did attempt in the genre were promoted as if they were not fantasy at all. This resulted in a series of flops for both channels which nobody realised at the time was probably due to caution and under promotion (as if they were embarrassed by them) rather than the quality of the shows themselves. 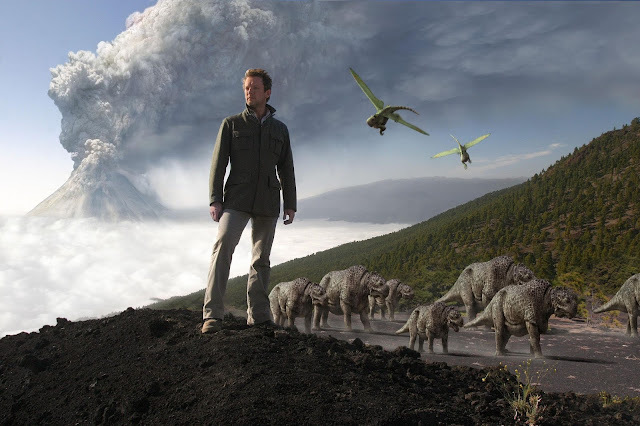 Hodges’ initial idea was of a man whose wife had disappeared in mysterious circumstances and he was eager to launch a drama series utilising the CGI dinosaur effects developed for the ersatz documentary series Walking with Dinosaurs, so he and Haines combined to create a series where dinosaurs were popping into our world with all the chaos that could create. The results have cost over £1million an episode to complete and even then there are some restrictions; notably a limit of 90 dinosaur shots per episode. Most of the dinosaurs are historically accurate and based on fossil records and to realise them clay models were created and then turned into three dimensional animation. “If you were making a film and you wanted your creature work to look this good, it would probably take several weeks per shot for the animation alone,” said Matt Fox, the series’ visual FX producer, “We were aiming to turn around shots in four days for the animation, half a day for lighting, a day for compositing and then delivering them to the cutting room. It was an incredibly quick turnaround.” Not that the series was sold on its special effects alone. “We hit every genre” said Jamie Payne who directed three of the episodes, “horror, thriller, comedy, romance and straight drama.” As for those comparisons with a certain Time Lord, Adrian Hodges admits that series like the revived Doctor Who and also Buffy the Vampire Slayer did provide impetus, “You can deal with big emotional story lines as long as you pitch it at the right level so the kids don’t get too restless” he suggests. David Pemsel, ITV's group marketing director added before the series started: "'Primeval' is a bold scheduling step into Saturday night family drama. We believe the series will have both a wide ranging family appeal as well as becoming cult viewing for aspirational adults." The proof of course came with the first episode, broadcast on February 10th. The 7.45 timeslot suggested that this may not be quite as family orientated a series as had been trailed yet in some respects it lacked some of the nuances that the first episode of the revived Doctor Who had possessed. Indeed, in a review the following day `The Sunday Times`’ AA Gill described it, factually, as a `new children’s show`. While people often do judge a series on its opener, I can’t remember one of recent vintage which had turned out to be the best, yet what it must do is draw people in and there is certainly a strong attempt to do that. The pace is as frantic as the ads had suggested, except for the odd breather, and the opening an excellent introduction pitting the contemporary- a supermarket car park- against the unusual- a big dangerous dinosaur. Cilla Ware’s direction is assured and stylish (if occasionally obvious) and the editing whipsmart. No complaints about the dinosaurs either, they look real and certainly dangerous enough and are utilised well. The attack on the kid’s bedroom and the encounter in the forest are the sort of things that will keep younger viewers glued and chattering later. For anyone older though, there isn’t a lot to engage as the script seems determined not to tax us. With the exception of the Connor character, it is hard to believe these people could ever exist; harder in fact than it is to believe dinosaurs are skulking about the Forest of Dean. Neither panicky nor especially awestruck, they seemed to quickly accept that fighting big rampaging dinosaurs is what they are born to do and that’s that. Not for nothing did Russell T Davies launch both Doctor Who and Torchwood by having a single outsider sucked into a bizarre new situation. Had Abby been that outsider and the others already tooled up and dinosaur ready, saving her from peril then it might have been a more satisfactory way into the milieu. That way too, we could get to know them through her whereas we are thrown a bunch of characters at once with no one to hold our hand. There’s probably one too many characters as well; not sure why the Stephen character is there and judging from his performance neither is the actor! I’m not certain Douglas Henshall is the right sort of actor for the main role either. Someone more unusual perhaps, more crumpled but determined. Most of the time he looks fed up! This incredulity stretches beyond the characters as well. Consider: a very large loud dinosaur attacks a house on a small estate and not one person even comes round to complain about the noise! Surely they could have afforded a few screaming extras? Or a harassed policeman? What humour there was comes from Connor’s attempts to ingratiate himself with the others who are so po faced they’d fit right in at Torchwood! Still in terms of momentum and as a vehicle to keep people watching Primeval makes a solid enough start and in ratings terms too, 6.7 million is not bad. Perhaps someone did travel in time and read the above comments before they’re even published as episode 2 is loads better addressing some of the opener’s problems, especially in introducing some more character work. Andrew Lee Potts is proving to be the breakout star of the show, his delivery of reasonably witty lines and all round geeky enthusiasm making him interesting. Hannah Spearit too, who has so little acting experience of course, is a vast improvement this week, Abby is becoming a more interesting person in her own right. Sadly the same can’t be said of Douglas Henshall who when faced with danger, emotion or anything else seems to grit his teeth and frown his way through. Given his reputation this is a major disappointment and although he’s supposed to be the main character, he is just not holding our interest enough. That said, there was a super creepy premise this week with giant spiders and centipedes and while some message board posters have criticised the show’s CGI, these spine chillers were rendered impeccably and that sort of scare is exactly what the show should be providing; again the direction is strong and the lighting subdued enough for maximum bumps. The bit where the centipede rears up at the screen and the first discovery of the spiders are certainly pushing to be labeled classic, if only because they give the creatures an animal abandon that a lot of shows don’t. We’re never left in any doubt that they are rapacious and very dangerous and that’s how it should be. Yet after only two episodes there is a sense that other elements of the show have not been thought through properly. The search for Cutters wife is intriguing but that’s about as much as there is for viewers over the age of ten. The doorway through which the dinosaurs come and go through (very politely in the case of this week’s spiders) should be a mystery, a wonder and a constant intrigue but its already being taken for granted. The script also fumbles the explorer/government interface, a favourite aspect of this sort of programme and unless they bring in another layer to this then we’ll end up with the same conversation every week. The third episode amplified these latter weaknesses; Ben Miller’s admittedly well played Lester seems to change his mind on a whim suggesting perhaps a government conspiracy of some kind – or even government complicity- but what he says never supports such depth. He is simply written as a pompous government nuisance spoiling the fun and trying not to panic the public, a character type we have seen a zillion times. Given that Cutter’s team seem at best accepting of the dangers and deaths the dinosaurs are bringing, you start to side with him yet you don’t understand his motivation. As for Cutter’s team; while they keep coming up with some great ideas as to why the anomalies exist, their banal personal conversations make you wince at times; characterised by Cutter’s meeting with his long lost wife after he passes through the anomaly and Abby’s infatuation with Stephen plot-line. After trumpeting the way the series would cross all genres, you get the feeling they’d have been better keeping the narrative rather more confined. Once again, it’s left to Andrew Lee Potts as the likeable and crucially very human Connor and especially Lucy Brown who plays Claudia’s role so perfectly to add character substance. Claudia’s clear feelings for Cutter and how these conflict with her role and his apparent ignorance of her feelings – this is the big relationship story of the show and she conveys this so well. 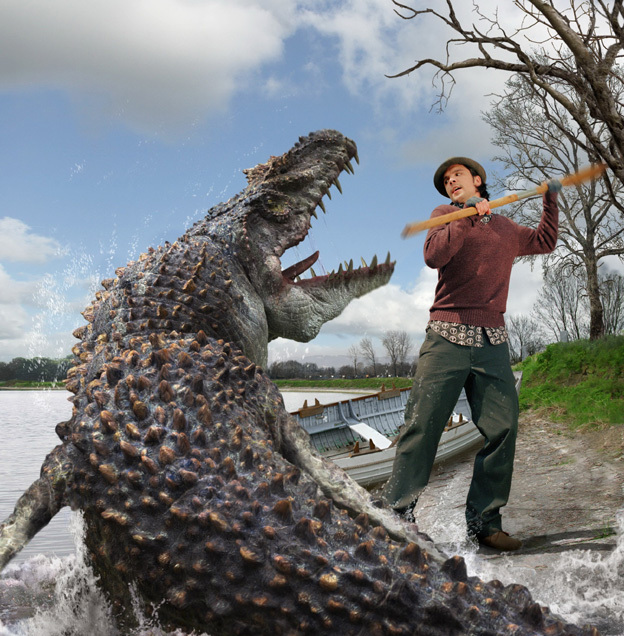 Monster wise, we get the Mosasaur, which provides another great image when it leaps up and swallows the diver whole but which later seems remarkably easy to beat off with an oar and at the end is positively playful with Cutter when it should just swallow him whole. An out and out thriller borrowing liberally – but successfully- from The Birds, the action sequences are very well staged with photo realistic flying dinosaurs, helped by some excellent sound work flocking about ripping people to shreds. Director Jamie Payne is really in his element here using lots of reactions shots and noises to convey the terror when Cutter and Claudia get trapped in the club house. Chris Lan’s script successfully exploits all the potential and often does so in broad daylight; particularly the scene where the marauders starts smashing through the windows and later when they flood through the chimney. The golf course scenes are equally well done; there’s a brilliant shot of Connor running towards the camera as the bird swoops behind him. Yet this tense action and blistering pace (the episode travels at twice the speed the opening two did) don’t get in the way of the characters. True, some of the dialogue remains a little uneasy and still sounds like dialogue but when good old Douglas H finally manages to come alive in this episode and we see his passion and anger, it’s a sign of the potential the series does have. Match that, too, with Helen Cutter’s sudden appearance to give them a hand and the series is starting to ask questions you want the answers to. Even the potentially filler material with Connor and Abby chasing Rex the friendly dino around in the woods sets up a classic horror moment when they suddenly find themselves face to face with a treefull of hungry things. While lacking something of the verve of the previous two episodes, the season closer certainly pulled some surprises out of the bag, not least a double cliffhanger at the end that must rank as one of the more head scratching of recent vintage. You can picture message boards and pub discussions working out the implications and that’s a good thing. Having improved in most areas as it’s gone along, the series has hitherto lacked any content that went more than surface deep but here it is layered on all at once with a monster from the future creating a time paradox. Relatively easy to think up, but difficult to make watertight, the revelation of a seemingly Claudia Brown free modern day (and by implication other things could be different too) seems great provided they don’t fluff it. It’s a tricky thing to pull off those last moments with a location that didn’t lend itself to dramatic revelation but is given extra edge by the fact that something big and dangerous is clearly breaking through the anomaly behind Cutter. It works well both as a welcome extension of the series’ hitherto restricted range and a way of getting us all to tune in ten months (ten months!!) hence. It also makes some sense of Claudia’s weird visions of a sabre toothed tiger that had lent the earlier part of the episode a dreamlike quality. All of a sudden the show seems to be working on multiple levels and providing more for the older audience members. The build up continues the lively dialogue, Helen Cutter’s untrustworthy demeanour (I wouldn’t trust Juliet Aubrey now if I saw her in Sainsburys) and a great prehistoric revelation. The future- bat-thing is very good albeit too fast or quite slow depending on the needs of the scene but in terms of providing a finale monster, a great draw. The sequence in the woods, with whizzy cameras is particularly effective, though the faffing about at the zoo maybe less so. They do seem to be struggling to find enough for all the cast to do which considering there are only six episodes shouldn’t be the case. Abby suffered from this later on as much as Stephen did in the first three episodes, something the writers will hopefully attend to. After all the hype and expectation and initial disappointment, Primeval settles into something that makes you want to come back for more, gradually unveiling it’s plot and moving away from the early formula it seemed to be set in. 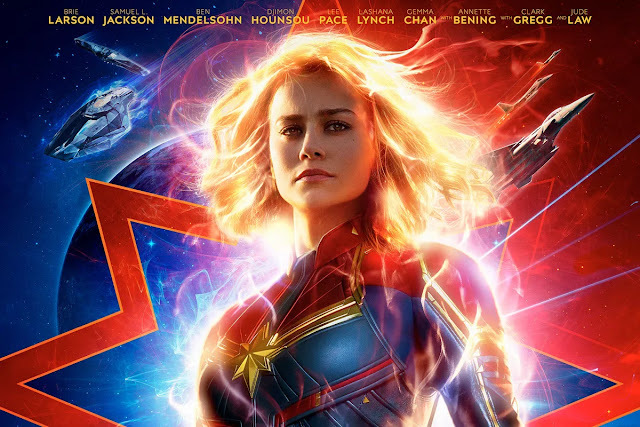 There are still issues to be addressed if it’s ever to be viewed as a `classic` of our times – and it certainly has that potential- most of which revolve around the cast and/or characters. The other thing is that while the first series would certainly stand up to further viewings- and some of the action and direction has been of the highest quality- there is something lacking in the scripts that means the show isn’t really about anything yet. Only the last episode really made an effort to stretch and intrigue us, even if was a time paradox rather than something of a more contemporary line. The potential is there and that wouldn’t mean sidelining the monsters as another Saturday teatime show has amply shown. 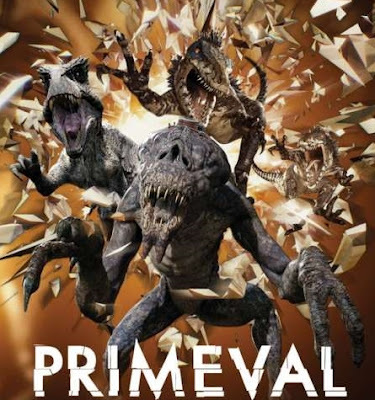 It’s good that Primeval is here, better that it’s won a second series and what the team needs to do is forget about comparisons, focus on what worked best in this season and go with that because it really does have the potential to become a great Saturday night show in it’s own right.